PanARMENIAN.Net - Otri Trio includes three enthusiastic girls playing violin, flute and viola. Members of the State Youth Orchestra of Armenia, they formed a trio in 2016, making the first appearance at the stage of the Cafesjian Center for the Arts in Yerevan. The recent concert, however, was unique of its kind. The musicians told the children about the instruments they play before the performance and engaged into a question and answer session after each piece of music. Following the concert, PAN talked to the children, their parents and performers. The mother of 10-year-old Karen Azaryan, who has hearing disorder, says they decided to attend the event to make the boy’s day more interesting. “I think it will contribute to his adaptation. The surgery helped restore the hearing, but he still experiences problems: he speaks hardly because of the hearing loss at the age of 3. I believe that today’s performance will have a positive impact. Maybe he will even choose music as his future career one day. Whatever, nothing matters more than being a good and clever personality,” she says. The boy’s mother says Armenian society has not matured yet for accepting the children with disabilities. “There are problems that won’t be resolved for many years. Sometimes, kids in the street stare at Karen’s osteophone, but parents don’t explain what it is for. He feels bad and asks why they are gazing at him. During different seminars, parents tell that other people look askew at their children with special needs. It’s all because of the lack of public awareness and it’s hard to endure, although I suppose it’s a little bit my fault too, as I often try to insulate Karen,” she confesses. The boy himself was pleased with the concert, saying it’s for the first time that he hears these musical instruments being played together. “It’s not the first concert I attend but I saw some instruments for the first time in my life. I am listening to piano music at home. Playing an instrument is good, but I am not sure I want to listen to these ones again,” he says. Another boy present at the concert, Edik Bashkhyan, says he liked it but didn’t notice any difference between the live performance and recording. “I listen to music via my phone and didn’t feel any difference. But I liked it here more, because I could see the instruments and the players, who were talking to us. I will tell my parents to take me to concerts again,” Edik says. Mary Ghazaryan reacts: “I liked the concert. I used to listen to music via computer, for example, Chopin. I choose the music myself and I want to learn to play flute.” Her sister, Susanna, adds that she liked the performance too, but she prefers to paint. 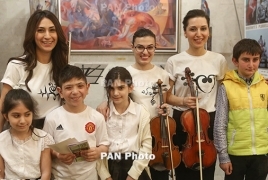 Flute player Ruzanna Tovmasyan believes that this short event gave the children an opportunity to have new dreams and goals. “Music demands no words but allows to interrelate with children and convey them some information that can’t be transmitted through speech. They might see the flute for the first time and take interest in it. They might even start thinking about becoming a musician, like they might see a canvas and decide to draw. The most important task is to trigger interest,” she says. Viola player Arevik Kosyan says they have performed for children scores of times, but it’s their first concert for the children with disabilities. “The concerts organized for children always proceed as a dialogue between the performer and the listener. This one wasn’t an exception: the kids were active and curious. Moreover, they already had some knowledge of music. Our decision to play for the children with special needs was conditioned by numerous problems persistent in Armenia. As it often happens, parents either don’t want or can’t afford to take their children to concerts or exhibitions, although communication is vitally important for them. In this museum, the children got an opportunity to see the paintings and listen to music,” she notes.